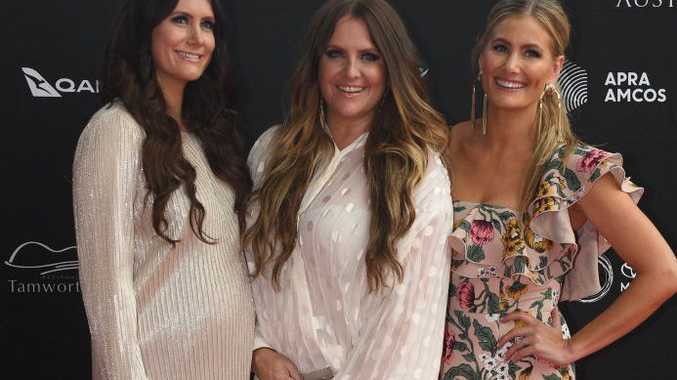 THE McClymonts won big at last night's country music awards in Tamworth. Grafton's all-sister trio - Brooke, Sam and Mollie - took out the coveted Album of the Year award for their fifth studio album Endless. They also took home the gong for Group or Duo of the Year and Contemporary Country Album of the Year, bringing their total of Golden Guitars to 15 over the band's 11 years in country music. "We stand here as three women, three mothers who are so grateful," Brooke said, as the Northern Daily Leader reports. "This is really fabulous for us." The sisters took to Instagram to thank their fans for their hat trick, writing: "We get to do what we love everyday because you buy the albums and come out to the shows and we certainly never take for granted how lucky we are". The trio has been on a break as Mollie and Sam start and expand their families. Sam and her husband Ben welcomed their first child, son Wilder, in August and Mollie is pregnant with her second child. In their acceptance speech last night, Sam also revealed her doubts about navigating life as a working musician and mum. "We did think we couldn't do this anymore when we had children," Sam said. "We always give 110 per cent. We thought we'd have to give that away when the children came along." With Endless, the McClymonts have proven they can keep producing hit records and enjoy family life. Eldest sister Brooke is gearing up to release her first album and tour with muso hubby Adam Eckersley next month. Other big winners at list night's awards include Kasey Chambers, Aleyce Simmonds and Amber Lawrence and Travis Collins. During the 46th Presentations of the Country Music Awards in Tamworth, Kasey Chambers became the 51st person to be honoured with the industry's most prestigious Award - The Australasian Country Music Roll of Renown. Last year's winner, Troy Cassar-Daley presented the award and said Kasey had earned the admiration and respect of both her industry peers and her multitude of fans, all over the world. In accepting the award, Kasey paid a tribute to her parents Bill and Diane and to brother Nash, her long time record producer. "I definitely wouldn't have got to first base without my family and their involvement," she said. Kasey's album Dragonfly also won a Golden Guitar for Alt Country Album of the Year (to add to her current tally of 26 (14 individual and 12 shared Golden Guitars).